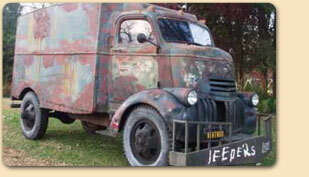 There were three trucks made for the movie, Jeepers Creepers, in 2001. Concept sketches were made by Brad Parker, followed by Steven Leglers design sketches. At this point, Truck 1 was created to match the design sketches. There were a few compromises. The original design sketches depicted a rounded top, front to back and side to side, like an old panel truck. Several of the body lines also continued along the sides near the bottom. The first truck had a flat top from side to side to ease the construction effort. The lower body lines of the cab were also forfeited, leaving just one raised stylish line running down the side of the body. After Truck 1 was complete, a few modifications were made and plans were drawn up before completing Trucks 2 and 3. Truck 1 - Ours was the first truck created and served as the prototype. It is unfinished to some degree. For instance, there are no arched pieces along the bottom sides of the box and the over-the-cab extension is clearly different than the subsequent two trucks. It may or may not have been used in filming. Truck 2 - The second truck in production (Truck 2) now belongs to Tim Glace. 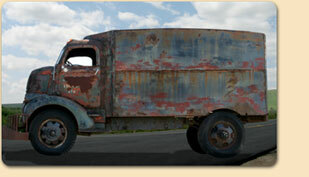 His truck is the “six-cylinder” truck and still has the original 216 motor and 4 speed transmission. Truck 2 runs and was screen used throughout the movie in various scenes. It can be easily identified by several key characteristics, including a hood more recessed with dents and indentations. The arch along the bottom of the box is also more narrow, and less curvaceous. 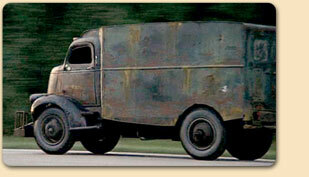 Truck 3 - The third truck (Truck 3) created for the movie was updated with a newer Chevy V8 and automatic transmission. It was used for most of the stunt shots and chase scenes. The arch along the bottom of the box is a little wider than Truck 2’s. Both Truck’s 2 and 3 have taller over-the-cab extensions than Truck 1. The location of Truck 3 is unknown at this time.